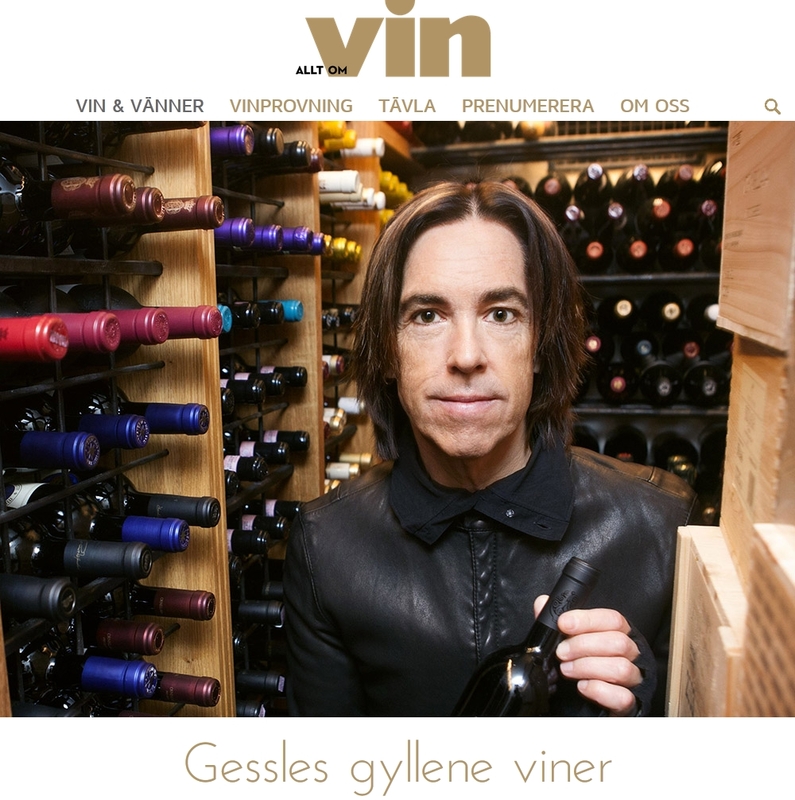 Mikael Mölstad from Allt om Vin interviewed Per Gessle. They were talking about Per’s passion about wines. Per drinks more expensive wines than many others, but it’s mostly because he can afford it. He believes that good wine experiences are available in most price segments anyway. Oj, it was when I started touring when I was around 20. Before that I drank almost nothing at all. This was in the late ’70s and I had read that Keith Richards drank Blue Nun, so I would of course try. I knew nothing about wines, but thought if Keith did something I should do the same. But oh, what a disappointment it was – it was just disgustingly sweet. The first real wine experience I had when I turned 30 and I got a Château Malartic-Lagravière 1982 from Thomas Johansson, our concert organizer. That wine opened a new world for me. Per was asked about his greatest wine experience. He says it’s almost impossible to answer, but he would say his last great acquaintance, a Cheval Blanc 1986. He talks about he started with Bordeaux wines, then more Californian and Italian wines. He also became more curious about Burgundy. Per says, the older he gets, the less he likes New World wines. They are a little too sweet and have a bit too much alcohol. About the best wine and meal experience he says there are some. He mentions a lunch in Verona with good pizzas and a champagne, Billecart Salmon Rosé. Another experience he mentions is a bottle of Ornellaia with caprese, prosciutto and classic Italian meals at one of his favorite taverns in Tuscany. Per’s favourite everyday wine is his own Kurt & Lisa. A dream wine tasting he would love to participate in is a vertical tasting [where you have a number of bottles from the same winery, that are spread out over a number of vintages] of Château Petrus or Latour with some of his best wine friends. To the question which wine region he would happily return to he replied he is very fond of Tuscany, so it is always his first choice. A wine region he is longing to visit is Napa Valley, for he hasn’t been there yet. Per says it would be great to experience some of his favorite Californian wines on site, such as Bond and Harlan Estate. Mr G’s favourite red wine grape is Pinot Noir. He wants to learn more about Burgundy and he hopes soon to experience some great wines from there. Per’s favourite green-skinned grape is Chardonnay, blanc de blancs from Champagne or from Southern Burgundy. Per tells Allt om Vin that some wines he buys from each year, e.g. Ornellaia and Solaia. Otherwise he gladly buys champagne. His last purchase was a Larrivet Haut-Brion. He prefers keeping older wines in his wine cellar and he likes to go back to wines from the ’80s and ’90s. Per says one can’t experience such wine tastes these days. On a side note next to the interview you can read besides some other well-known details that Per’s hidden talent is being a hell of a table hockey player. The fabulous PG photo in the article is by Anders Roos.